Formed in 1998, Antiquus Scriptum is the brainchild of Portuguese multi-instrumentalist Sacerdso Magus. Over the years, the project has had a fair share of line up changes, but Magus has soldiered on; releasing five full lengths and a bevy of splits, compilations and demos, not to mention a seemingly sea of endless reissues, re-packagings, and re-relesaes. One such reissue, a CD version of the band’s third demo, In Pulverem Reverteris (2000), was recently dropped by the US based Elegy Records. Though the demo has appeared on a few versions of the band’s first full length, Abi in Malam Pestem, this seems to be the first standalone CD issue for this demo. Though the project has come a long way in the sixteen years since this has been released, this demo is a fine look back on where Magnus and crew started. 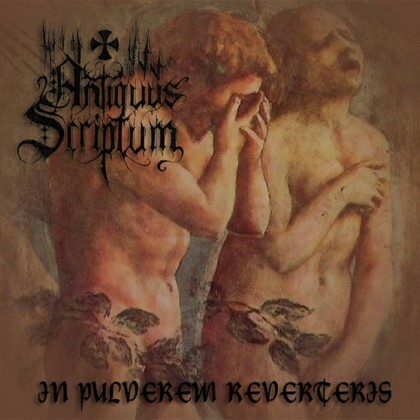 In Pulverem Reverteris features four tracks, one of which is a flippant neoclassical ambient introduction and an outro that closes off with the sounds of running water, birds chirping and mellow acoustic guitar before building into medieval hand drums and chanting. While those tracks offer a splendid backdrop to revel in the medieval sounds that have been strewn throughout the catalog of Antiquus Scriptum, it’s the middle two tracks that offer the most to dig into. That being said, the title track is a short, two minute chunk of blasting drums, chainsaw tremolo riffing, and flighty, almost happy sounding keyboard strikes. It sounds a bit strange with the uplifting, charging keyboards blaring through the raucous din. What’s left then, aside from six minutes worth of intro/outro and a short two minutes blasterpiece, is the sprawling, nine minute “Bula Ad Extirpenda (Innocentio IV, 1252 – Thy Saint Office of Inquisition of Faith)”; what a mouthful. This is where one can truly see the spark of what would make Antiquus Scriptum so special in coming years. The track fires away with ridiculously fast programmed drums and a loud abrasive guitar sound that focuses on rifling through cycles of trem riffs at a high rate of speed. It’s very overwhelming for the first few passes, especially once the higher pitched, screamed vocals kick in (reminiscent of Dani Filth circa Cruelty and the Beast, of all things), but once the brain allows focus it should be immediately apparent that Magnus creates some monstrously ripping riffs that flit between amateurishly rollicking and decidedly grim and frostbitten. The riffs twist and twine, serpentine in their approach, relenting only for the choral vocals and the all too brief and a little overly loud, folk-laden keyboard passages. While it’s not on the same tier as the band’s later period material, it’s still an impressive work. There’s only around ten minutes of metal here, but the band sandwiched it between some folky, medieval stuff to give a little breathing room. This one of those bands that didn’t click with me at first, but after digging and really focusing on what Magnus was doing with his riffing, things began to open up. In Pulverem Reverteris isn’t really essential material, but it’s really cool to see what Magnus and crew were doing sixteen years ago. This entry was posted in Black Metal, Folk Metal, Reviews and tagged Antiquus Scriptum, black metal, Elegy Records, folk metal, In Pulverem Reverteris, portugal, progressive metal, reissue, viking metal.